Participants will live in standard single occupancy student bedrooms with either shared or private bathroom facilities, according to preference. A limited number of rooms have two single beds, and these will be made available for those wishing to share on a first come first served basis. Rooms will be in buildings adjacent to the main college site. There will be a Formal Hall each week. 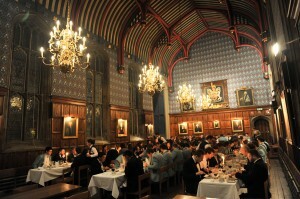 These three-course meals, a Cambridge tradition dating back centuries, will be served in Corpus Christi’s historic dining hall and will be preceded by drinks on one of the College lawns (weather permitting). A traditional English Afternoon Tea, with sandwiches, cakes, scones and jam, and tea and coffee, will be held in College each week. Summer school participants will also be provided with swipe cards to take meals in the College cafeteria (breakfast, lunch, dinner) or College bar (light snacks, drinks), with sufficient credit to purchase approximately two meals (breakfast and one other meal) per day in Cambridge. This partial meal plan will give participants the opportunity to explore the many wonderful cafes and restaurants around the city.